January 15th is the feast day of St Maurus, a disciple of St Benedict who is famous for his role in one of his master’s more impressive miracles. This is recounted by St Gregory the Great in chapter 7 of the Second Book of his Dialogues, which is devoted to the life of St Benedict. 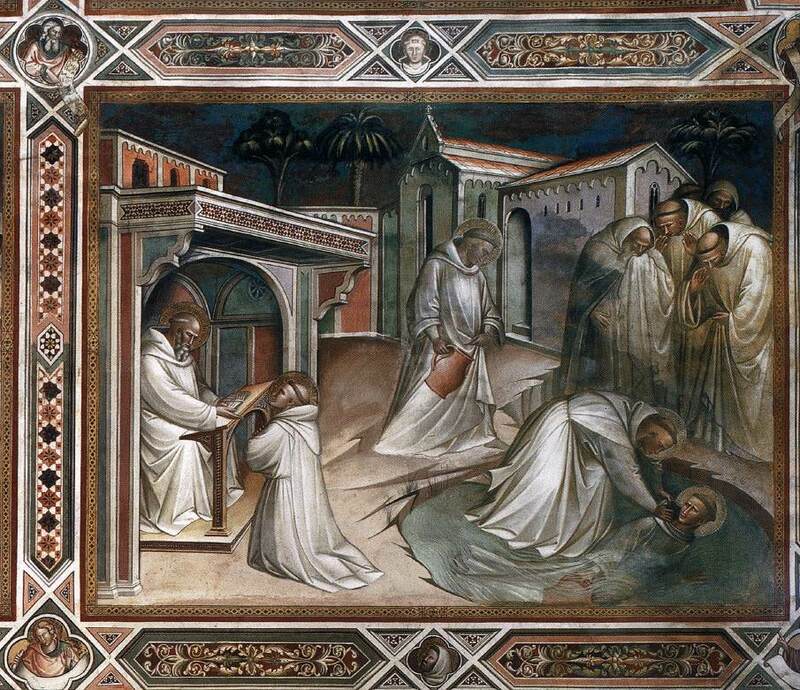 St Maurus Saves St Placid from Drowning, by Spinello Aretino, 1388, from the sacristy of San Miniato al Monte in Florence. The church is still to this day the home of a community of Olivetan monks; in accordance with a common medieval custom, St Benedict and his contemporaries are depicted in white Olivetan habit. A marvelous thing, and unheard of since the time of the Apostle Peter! Having asked for and received a blessing, and departing in all haste at his father’s command, Maurus ran over the water to the place whither the young lad had been carried by the water, thinking that he was going over the land; and took him by the hair of his head, and swiftly returned with him. As soon as he touched the land, coming to himself, he looked back, and realized that he had run on the water. That which could not have presumed to do, being now done, he both marveled and was afraid of what he had done.